Welcome to the Style Fishing webpages. We design and bring on market high quality fishing equipment. Our comprehensive ice fishing collection you will find suitable lure for every fishing situation and the weather conditions. There is a guaranteed classic ÄIJÄ, sea and big perch absolute number one HEPPU, peaceful swimmer UKKO, competition anglers favorite KARJU, lively SETÄMIES and balanced lures, tungsten mormyshkas and much more. Check it out. Experiment you find your own favorite! We have brought to market shad jig collection called AALTONEN. Aaltonen is the result of long-term planning. Aaltonen is a completely new type of fish imitation jigs, which combines fishing ability, adaptability and quality. Something new for winter! Versatile, vibrating and sliding swimming. For big perch to be used in shallow water. Length 45 mm, weight 4 g. Model: ringed Color:..
Pier lure LEIJA has got new smaller sizes! Lures works well in competitive situations, where each hit is important. Small lures swim slowly to the bottom and often.. 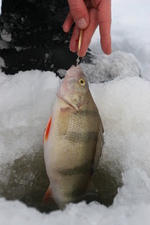 Double hook KAKSONEN is a new kind of hook pattern, which are developed ice fishing with a perch eye. The perch eye is easy to put on the hook and it stay an excellent..
You don't have to always go fishing to the big lakes or sea. Little forest lakes you can also get a big perch throwing by the shore. This time the biggest was 41..
Jig Head HEIKKI New innovated jig head! Wire holders on the both sides of jig are pressed onto the jig. Ensures the jig stay at the jig head. The jig stay in the..
Koria Outdoor Life Fair will be held this weekend from 9th to 11th June in the Kouvola Pioneer park. You can find Style Fishing at Talliaukea department F5. Welcome!..